Q84. What is your favorite way of keeping yourself healthy and why? Argument: I tend to eat healthy, do a moderate amount of exercise, and reduce Stress. Support 1: Eating healthy is a very important way to keep yourself healthy. Support 2: Regular exercise is very Important to keep healthy. Support 3: I keep my mind and body healthy by doing activities that help me relieve Stress. Thesis: All in all, I have three ways to keep my body healthy. The first way is to eat healthy and balanced meals throughout the day. I also like to keep my body moving by walking everywhere. Lastly, I think it’s very important to do activities that relive stress. There are a number of ways to keep your body healthy; dieting exercising, and pills are just a few. Out of all of these ways, I tend to eat healthy, do a moderate amount of exercise, and relieve stress. First, eating healthy is better for our bodies in the long run. Second, a moderate amount of exercise helps. Third, doing things that relieve stress, such as going to the spa or reading a good book is important. Therefore, my favorite ways to keep myself healthy is eating healthy, exercising and doing stress free activities. First, eating healthy is a very important way to keep yourself healthy. If I do a fad diet, then after I finish the diet, my body will like a rubber band and bounce back to the weight it was before the diet. So, eating a diet full of fruits and vegetables. with little meat and a small portion of carbs is the best for me. When I eat healthy, I feel better and I have a lot more energy. I feel better about myself and my body and I have a positive attitude. Second, regular exercise is very important to keep healthy. I don’t run every day because it ts very bad for my knees. However, I love to hike every weekend and to walk everywhere. I usually walk 10 kilometers a day at the minimum. I do this by walking instead of taking a bus to the store. It’s a great way to bum calones, see the sights, and to feel refreshed after a long day of working inside. You do not need to pay money and go to a because you can incorporate exercise in your life everyday. 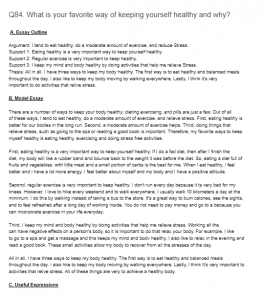 Third, I keep my mind and body healthy by doing activities that help me relieve stress. Working all the can have negative effects on a person’s body, so it is important to do that relax your body. For example, I like to go to a spa and get a massage and this keeps my mind and bodv healthy. I also like to relax in the evening and read a good book. These small activities allow my body to recover from all the stresses of the day. All in all, I have three ways to keep my body healthy. The first way is to eat healthy and balanced meals throughout the day. I also hke to keep my body moving by walking everywhere. Lastly, I think It’s very important to activities that relive stress. All of these things are very to achieve a healthy body.